The things you can add to noodles to make a delicious meal seem pretty much limitless. This one comes together quickly and tastes pretty darn great. 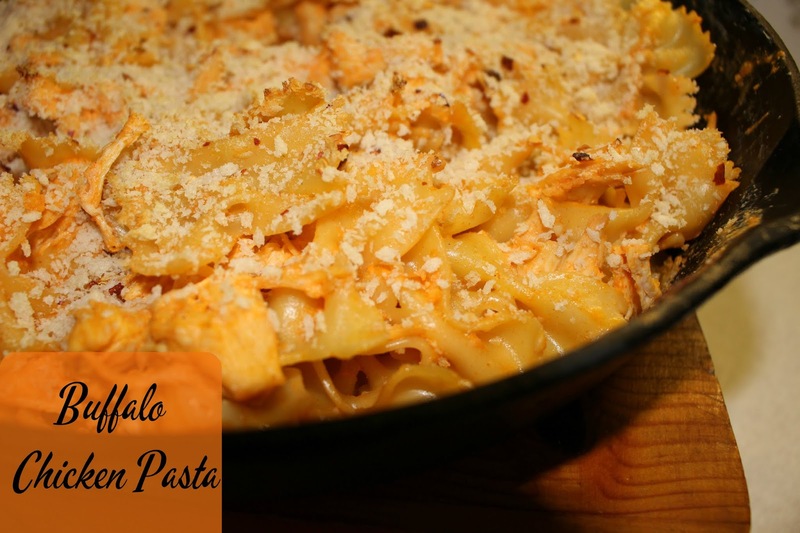 My hubs isn't a huge buffalo sauce fan, but he still manages to eat this pasta. One thing about buffalo chicken that I don't particularly care for is blue cheese. I know, I know. Well it is true. So I substitute blue cheese in my recipes with ranch dressing. It is still creamy and comes out full of flavor. I also bring my noodles to a boil in a large skillet on my stove top. Yep! Instead of bringing a pot of water to a boil and then waiting for the noodles to cook, I just dump all the noodles into the skillet, add water until they are covered completely and bring it to a boil. This cuts out so much time waiting for the water to come to a boil. The surface area is larger, so the water heats up quicker, thus resulting in a quicker noodle cooking time. Seriously, give it a try...you will never go back to the other way. Another thing I like to do when making pasta dishes, is when I combine all the ingredients together, I do so in my largest iron skillet. I can combine the sauce ingredients in the skillet on the stove. Toss in the noodles and chicken and then just pop the entire thing into the oven. It eliminates another dirty saucepan also. So for this whole meal, I used one iron skillet, a large skillet for the noodles to boil in, and then another pan to cook the chicken in beforehand. You could use any shredded cheese you would like. I happened to have cheddar on hand when I made this for the photos, so that's what I used. Mozzarella is good though as well. This is a filling dish that would be good on Sunday while watching the football games. In a large skillet (I use an iron skillet) bring the milk to a simmer. Add the buffalo sauce, cream cheese and the blue cheese or ranch dressing to the milk. Whisk in the garlic powder and some red pepper flakes. Stir in the drained noodles and shredded chicken. Coat well in the sauce. Mix together the Panko and melted butter. Sprinkled shredded cheese over the noodles, if desired - then sprinkle the Panko mix over the top. Add a sprinkle of red pepper flakes to the top. Place in the oven and let cook for 20 minutes or until the bread crumbs have browned. Let sit for five minutes before serving.